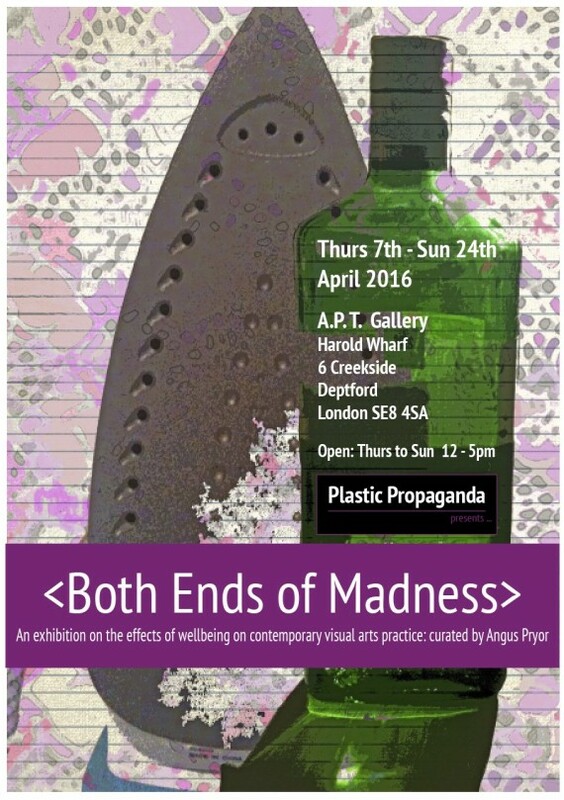 An exhibition on the effects of well being on contemporary visual arts practice. Harold Wharf, 6 Creekside, Deptford, London, SE8 4SA. Open Thursday to Sunday 12 – 5pm from 7th – 24th April. This is a group exhibition featuring the work of: John Brennan, Richard Brooks, John Butterworth, Anjula Crocker, Mandakini Devi, Dom Elsner, Jez Giddings, Lucy Gresley, William Henry, Mark Howland, Emma Moody-Smith, Angus Pryor, Mike Walker & Heidi Yssennagger. Please do come along to our PRIVATE VIEW on Thursday 7th April 6-8pm. This exhibition includes a PUBLIC SYMPOSIUM on Thursday 14th April 6-8pm at APT Gallery. This event will explore and discuss some of the issues and themes suggested by the exhibition, including the iconography and content of specific works on display. There will be an open Q&A session with involvement warmly invited from the audience and members of the general public. The symposium panel contributors will include Professor Janet Sayers, Angus Pryor, Tony Gammidge and Dr Grant Pooke.